Disability - Social Inclusion of Persons with Disabilities - Online Tutor Pakistan, Online Tuition Karachi Pakistan, +92332-3343253 Skype id: ascc576, Online tuition Tutors Pakistan, Saudi Arabia ,Online Tutor Academy Pakistan Qatar, Kuwait, Saudi Arabia, USA, UK, Canada, Australia, Karachi Lahore Islamabad, Online Maths Physics Stats Tutor Karachi Pakistan, Online Tuition Pakistan,Online Tuition Pakistan, Online tuition in Karachi, Pakistani tutors, online tutors in Pakistan, Karachi tutoring, Online tutoring, Online math tutor Pakistan, Online Physics Tutor Pakistan, Online Teacher Pakistan, Online Chemistry Tutor Pakistan, Online Biology Tutor Pakistan, Online Economics Tutor Pakistan, Online tutor Accounts Pakistan. Disability: Every person in this world has obligations and rights towards everything he is connected to. Without a doubt, all these rights are necessary, but the prominent rights that social activists nowadays are working hard to protect are women’s rights and the mandatory rights of persons with disabilities. The fundamental discipline to maintain rights is a simple rule; if obligatory actions are taken by every single citizen to fulfill rights, then, no person would be left with unprotected or unfulfilled rights. The basic compulsory right of disabled persons is inclusion and importance in society. If these special persons are provided with their rightful position then, it becomes easier for them to achieve their goals or pursue their dreams. The fact that they are not supplied with a platform to polish their talents cannot be ignored. With no suitable space for their creativity, they hide their remarkable talents which results in severe loss for the country as they miss out on a creative individual with raw talent. But the examples of original talent and true effort are among us who won hearts worldwide besides their disabilities, and proved that hard work is unstoppable. Stephen Hawking, a well-known English theoretical physicist, cosmologist and author who showed true examples practically of hope, passion and not to mention, his abilities regardless of his disabilities. Stephen Hawking’s researches presented ground-breaking discoveries. Doctors diagnosed his serious neurological disease Amyotrophic Lateral Sclerosis (ALS) and acknowledged him that it was the early stage of that disease and he had two and a half years left to live when he was 21. That was the time when all hope felt lost for him. It was devastating news for him and his family, but a few events prevented him from becoming completely despondent. The first of these came when Hawking was still in the hospital. There, he shared a room with a boy suffering from leukemia. Relative to what his roommate was going through, he later reflected, his situation seemed more tolerable. Not long after he was released from the hospital, Hawking had a dream that he was going to be executed. He said this dream made him realize still, there were things he desired to do in his life. In a sense, Hawking’s disease helped turn him into the noted scientist he became. Before the diagnosis, Hawking hadn’t always focused on his studies. With the sudden realization that he might not even live long enough to earn his PhD, he poured himself into his work and research. After a few years, when his condition worsened, he was forced to use a wheelchair. Decades passed by, he published several books including ‘A brief history of time’, ‘The Universe in a Nutshell’ and ‘On the shoulders of Giants’ which were considered his best ones. He also co-authored a series of children fiction novels with his daughter. His major work was on black holes. Hawking was awarded multiple times. He was given the Wolf Prize, a prestigious international award granted in Israel. And Royal Astronomical Society (RAS) presented him the highest award of RAS, Gold Medal. He was also given Copley Medal and Presidential Medal of Freedom by the Royal Society. Recent this year, upon his death, Stephen Hawking finally succumbed to the disease that was supposed to have killed him more than 50 years earlier. Helen Admas Keller , kind-hearted woman who had a tragic story of her own .When she was just two years old, she suffered from a sickness which has diagnosed by the doctors as ‘Brain Fever’. In this illness, Helen’s body was burning up with fever and after the fever was gone, her parents realized that their daughter had lost her sense of sight and hearing . Her formal education was greatly interrupted due to her illness. Luckily, her father found a brilliant and soft spoken teacher, Ms. Annie Sullivan and hired her immediately. She was a lady with patience who practiced what she preached. She herself lost sight as an infant but got it back after a few years. She was very thankful for having her sight back and showed her gratitude by helping other people who were going through the same as she could understand their state because she had gone through the same. Miss Sullivan was very able and experienced because she was a teacher at Perkin’s School for the blind at that time .She tried a quite effective method for her to become able to speak. She started teaching Helen to write and speak with the ‘Touch and Feel’ method. One day, she took Helen to the beach and put her hand in the water and told her to feel it. Then, she put her hand on the sand and wrote W-A-T-E-R with her fingers. Afterwards, she put her finger on her own lips and told her to feel their movement. Helen Keller, due to her love for education, began speech classes at the Horace Mann School. She learned to speak so others could understand her and improved her communication skills. She was determined to attend college. She joined a preparatory school when she started to get famous. She met Mark Twain and befriended him who introduced her to his friend, Henry H. Rogers. Rogers was a Standard Oil executive who felt impressed by Keller’s driven personality that he offered to pay for her to attend Radcliff College. There, she was accompanied by her faithful mentor, Miss Sullivan, who sat by her side to interpret lectures and text. She graduated easily. Helen Keller wrote her first book ‘The story of my life’. She remained friends forever with her guide, Miss Anne Sullivan. She was right there by her side when she was on her death bed taking her last breaths. Keller was the first blind person to earn a bachelor of arts degree. Helen Keller teaches us many important things of life: true spirit, pure joy, the art of finding happiness in the smallest things, hard work and kindness. She climbed the stairs of success with firm steps alongside persistence. Helen Keller visited Pakistan in 1956 to share an encouraging message in the school for the blind, dumb and deaf children. The above examples are indeed outside the country but it is not hard to find talent in our very own country, Pakistan. We are blessed with talented people with creative minds if only we understand their worth. Belonging from Pakistan, bringing the change she wanted to see and way to pursue dreams, Muniba Mazari , a true ideal because she went after what she desired regardless of what people would say, because people don’t matter, you do! She unfolded her story on media after unfortunate series of events. Muniba Mazari got married at a young age. After two years, one day, she was in a car drive with her husband. There was a huge ditch up ahead of which the couple sat totally unaware of. At the last minute, when they saw it, they were unable to act quick or the breaks were not working on such speed. But at the very last moment, her husband jumped out of the car, saving himself. But poor Mazari was taken to the hospital as her ribs, back bone and other bones had gotten fractured. That accident changed her life forever. She was under operation for days. She received bad news for three consecutive days. The first day, doctor said that she could not paint due to the fracture on her wrist. She decided to cope with this news with hope. The next day, doctor told her that she will not be able to walk again because of her damaged backbone. She took deep breaths and thought of facing her fate with courage. Little did she know that the worst news awaited her. The following day, the doctor told her that due to the fixation in her back which was really bad, she could not give birth to a child. The news broke her heart. Feeling devastated on the verge of despair, she started to question her existence. All these heroes have different stories that led to their positions but they all have one thing in common: the spirit to move on with hard work. 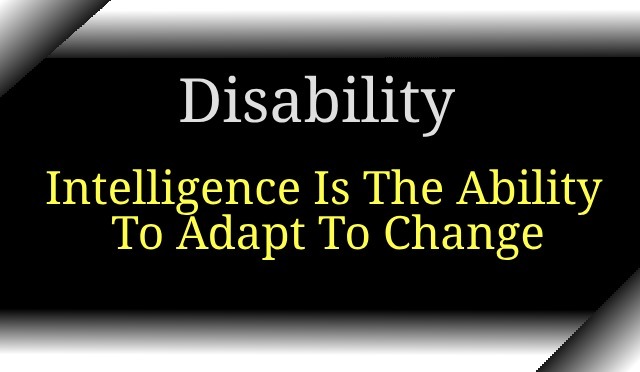 There is a vital part for us to play in order to achieve complete inclusion of persons with disabilities in any field. Institutes must improve and increase rapidly. But there are already many special centers which have been setup for special persons to take part in their chosen field. An extraordinary Olympic game was introduced years ago which included categories of sports which were especially designed for the disabled. A cricket match which has a special ball with sound functioned for blind cricket lovers. Nowadays, one can become anyone if he has the required passion and spirit. The key to success as told by people who are considered the most successful is that there is, in fact, no key to success at all. There is no key to success, just keep going, do not be dishearted or give up. There is always something that you can do, you just have to find it. “They always say that failure is not an option. Failure should be an option because when you fail, you get up, and then you fail and then you get up and thatr keeps you keeps you going.” – Muniba Mazari. Social activists are working hard to establish rights but we must play our part too. Everyone should should share their fair share of ideas regarding this topic.